The Boeing 737 first flew in 1967 and since then has become the world's best selling airliner with Boeing just recently delivering the 10,000th 737 to Southwest Airlines. 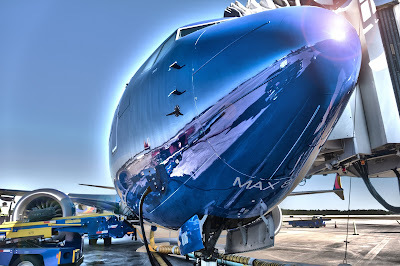 Major updates and enhancements over the decades mean that the newest generation of 737s, the MAX series, while bearing a family resemblance to the earliest models, is packed with the latest technology in avionics and propulsion. I recently had the opportunity to fly a 737 MAX 8 for the first time. We had been scheduled to fly a 737-800 for the sequence, so when a MAX 8 showed up I was quite pleasantly surprised. My next concern was whether I'd remember anything about the new features of the airplane. Our differences training had been accomplished months earlier through an online course. As it turned out, there was little to be concerned about as the cockpit displays, while larger, incorporate all of the familiar elements from the NexGen series with a few welcome additions. 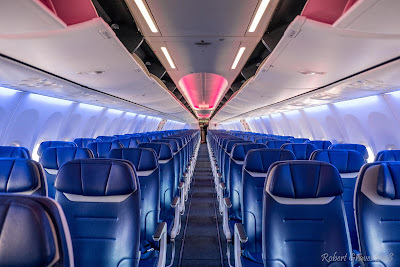 (The NexGen 737s consist of the 600-900 series first introduced in the late 90s) I felt at home in the MAX cockpit right away. The MAX 8 in our configuration has a 175 seat single class capacity with a standard crew complement of four flight attendants and two pilots. The layout and galleys are very similar to our -800s. There are two lavs aft and one forward. 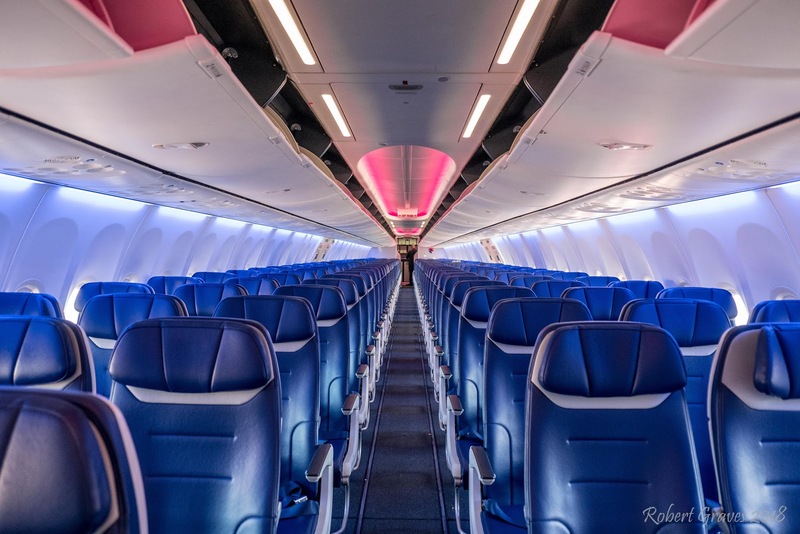 The MAX comes equipped with Boeing's new Sky Interior which features programmable LED lighting and mood music for boarding and deplaning. The seats themselves have adjustable headrests and a generous 32" seat pitch and 17.6" width, the widest of any 737 variant. Moving back up front, the most dramatic feature of the MAX is the cockpit displays. 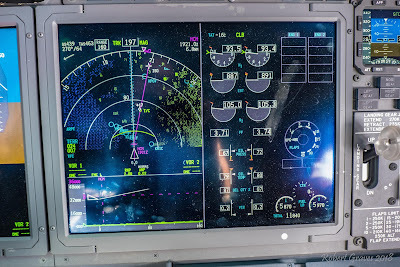 The six 7 inch square display units in the NexGen (NG) aircraft have been replaced by four 15 inch wide display units. Separate mechanical features of the NG such as the flap indicators and clock are now displayed on these larger units. The gear handle and standby flight instruments have been relocated between the center displays and are now equidistant from both pilots. 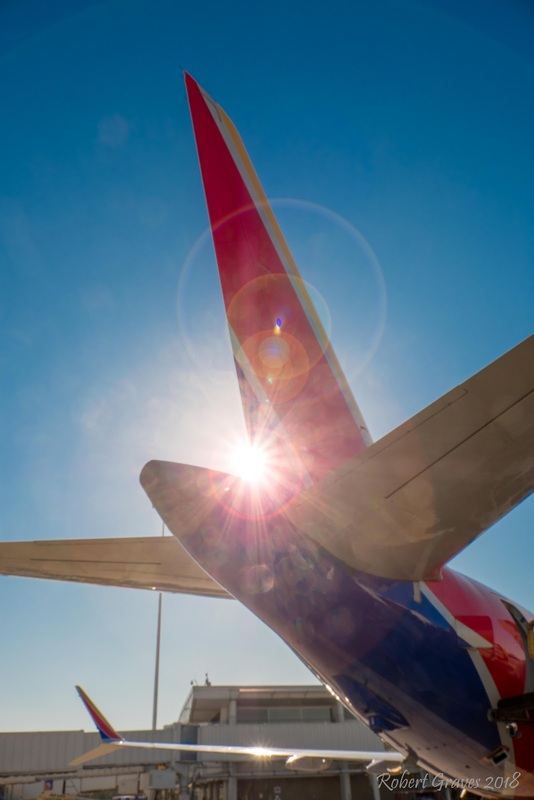 We were scheduled to operate as WN 5599 from DCA (Washington Reagan) to MCO (Orlando). The enroute burn was planned at 1+59 and 9000 lbs at an altitude of FL400 or 40,000 ft. 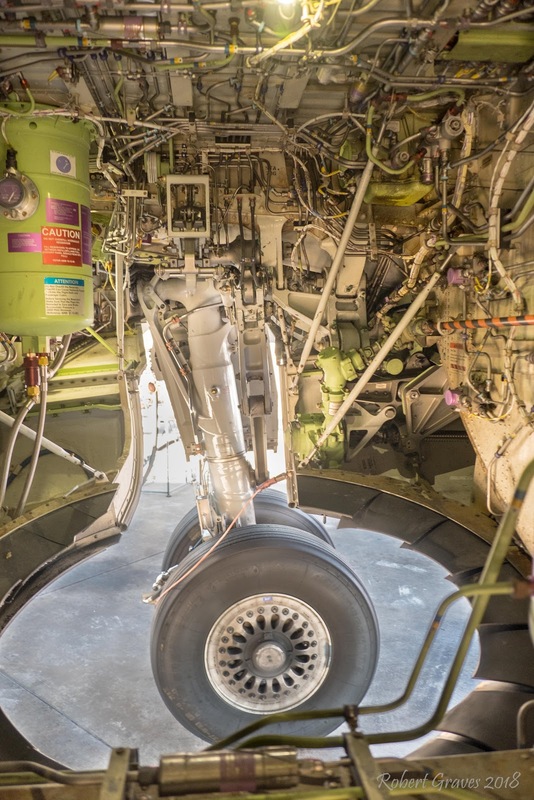 The aircraft was carrying two deferred maintenance items, the onboard network system, and the first officer's ILS system resulting in a downgrade to CAT I ILS status. As the weather was VMC at both our departure and destination, this was not a concern. Our takeoff weight was planned at 144,400 lbs, well below our max allowable of 159,800 lbs departing from runway 1 in DCA. Our maximum takeoff weight was determined by the maximum allowable structural landing weight of 150,800 lbs plus our planned burn of 9000 lbs. The planned fuel was 14,900 lbs which included 2000 lbs of contingency fuel in addition to the standard 45 minutes of FAR reserve or 3200 lbs. I was immediately impressed in how little fuel it was going to take us to get to Florida. The LEAP-1B engines deployed on the MAX are 15% more fuel efficient than the CFM56 series engines on the NG aircraft. 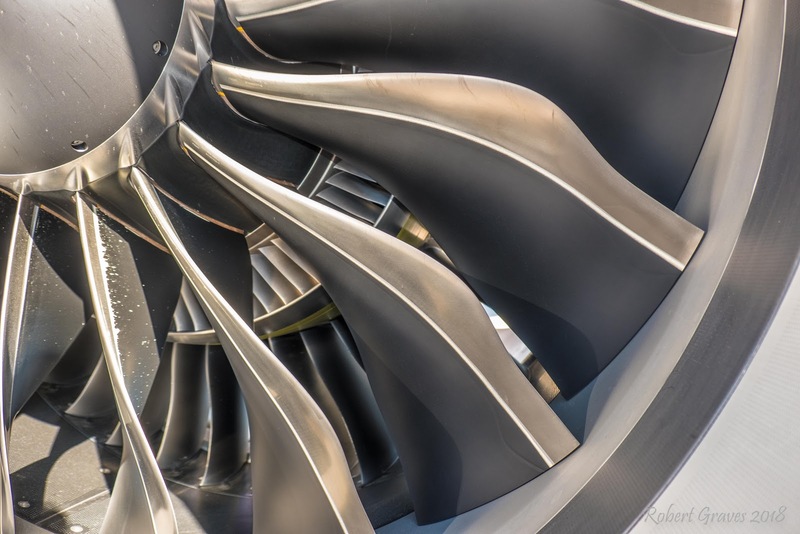 These efficiencies are the result of an increase in the bypass ratio from five on the CFM56 to nine on the LEAP-1B and an internal pressure ratio increase from 11:1 to 22:1. A significant weight reduction in the rotor of the LEAP-1B adds to the fuel efficiency of the engine but also adds some restrictions on start and shutdown which I'll address later. Our preflight checks and flows were nearly identical to our NG aircraft. Our clearance from DCA was on the Boock2 RNAV departure. Departing to the north from DC always requires extra vigilance due to the proximity of the prohibited areas around the White House and the Naval Observatory where the vice president's residence is located. The authorities have an extreme lack of understanding and humor should an airliner even brush into one of these areas. The departure requires an immediate left turn after liftoff to track the Potomac. As the wind was gusting out of the northwest, I elected to engage LNAV lateral navigation on the ground to have lateral guidance immediately after takeoff. Once we were loaded and had clearance from ground control, we started the pushback and start sequence. The restrictions on starting which I noted above now came into play. The rotor, or the spinning center shaft of the engine, had so much weight shaved off that it could have a tendency to bow when hot after shutdown. 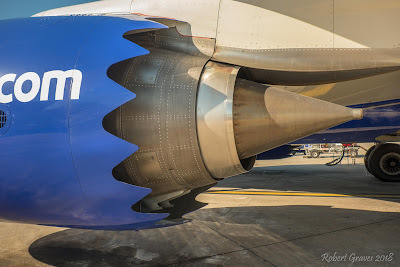 This bowing could cause the compressor blades to rub against the engine housing resulting in excess wear and possible compressor stalls on start due to air leaking around the gaps. To mitigate against this thermal bow effect, the computer will motor the engine before introducing fuel during the start sequence. The amount of anti-bow motoring is determined by the computer but can be up to several minutes before the fuel lever can be raised to start each engine. Once started, there is an additional three minute warm up period before takeoff thrust can be applied. This restriction is five minutes when the engine is started cold. There is also a firm three minute cool down period required before shut down as well. These restrictions will most likely not pose a problem except perhaps when you've pushed back onto a taxiway where other aircraft have to wait for you. The quietness of the aircraft became immediately apparent as soon as the engines were started. It is truly a quiet airplane. I fly with a Bose noise cancelling headset and didn't notice until we were nearly level at 40,000 ft that I hadn't turned on the noise cancelling feature. It was that quiet. The LEAP-1B engine employs the same scalloped or saw tooth pattern on the trailing edge of the cowling that is evident on the 787. This design smooths the mixing of the core and fan airflows, significantly reducing turbulent flow and noise. The aircraft steering had a nice tight feel to it, but any new aircraft should. I won't miss the wobbly shopping-cart nosewheel steering of our old -300s, which were retired last year. We were cleared for takeoff with little delay and were on our way. The takeoff roll was unremarkable save for the quietness of the engines. We had calculated a reduced thrust takeoff power setting, but the aircraft accelerated and lifted off smartly. The LNAV course became active almost immediately and we started our left turnout on the departure. I hand flew the aircraft up to about 18,000 ft before engaging the autopilot. 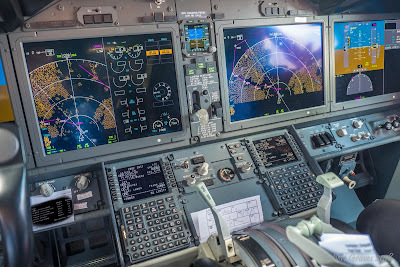 I thought the aircraft responded to manual controls similarly to our 800 series aircraft. The Boock2 departure tracks north and then makes a right turn for a nice view of the city...from the right seat! 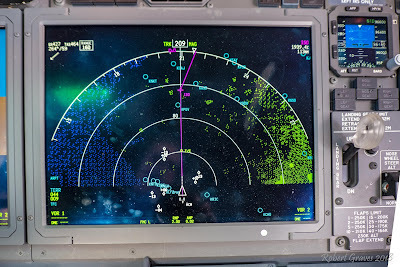 We quickly arrived at our cruise altitude of 40,000 ft, turned off the seat belt sign, and had some time to look at the new features on the displays. Other than being nearly twice as large as the NG displays, some new features such as a vertical situation display are included. When activated, this feature displays a side view of the aircraft's altitude and planned vertical navigation. It should come in handy for keeping situational awareness during complicated arrivals or when given a "descend via" clearance. Our flight plan had us flying the Cwrld4 arrival from over Ormond Beach. This arrival set us up nicely for a VFR downwind arrival to Orlando's Rwy 35R. The arrival went smoothly with the autopilot easily staying on path in VNAV. Our arrival weight was very close to the planned 135,400 lbs and we had planned for a flaps 30 visual approach. We were just about abeam the field at perhaps 3000 ft when we got the clearance for a visual approach, my favorite kind of clearance. Depending on controller preferences and traffic load, some controllers will call your every turn around the pattern. This type of hand holding can be annoying, especially if there is no other traffic in the pattern. Other controllers will just let you go to turn your own base and final. This was one of the other guys and he cut us loose. The key is to not screw it up and fly a bomber (wide) pattern or to cut in so tight that you end up going around. I disengaged the autopilot and autothrottles, and proceeded to fly the pattern by hand to get a feel for how the MAX flew in the slow speed regime. Flying a visual approach cross cockpit can have its own challenges as you can't readily see the runway, which is the primary reference in any visual pattern. Inside cockpit references can be used such as the FMC glidepath, wind arrow, runway DME (distance), and of course the best resource, the guy or gal sitting on that side of the airplane. I'd been descending on downwind with flaps at position 1 for extra drag. While I'll use the speedbrakes if I need them, my preference is to avoid using them if possible. Pulling the nose up, dropping the gear and extending flaps on schedule is my preferred technique for getting configured quickly. The MAX went through her paces brilliantly and we were lined up on glidepath about three miles out when I brought the power up. While I had to take a second look or two to see the electronic flap gauge and newly positioned gear indicator lights, I quickly adjusted to their new locations. The landing was uneventful and rather smooth if I do say so myself. The aircraft decelerated smoothly with the reversers and auto-brakes while the quietness of the engines again made itself apparent. We exited on the high speed and taxied to our gate. We had to start the timer after leaving the runway to ensure that we complied with the mandatory three minute cool down period before shutting down the engines. It wasn't a factor in this case as the taxi time was longer than three minutes. The LEAP-1B engines are eight inches in diameter larger than the CFM engines on the NG, so in order to maintain the same ground clearance, the nose gear was lengthened about eight inches. This gives a slightly different picture while taxiing, but I found the landing picture to be very similar to the -800. The longer nose strut becomes apparent after lowering the nose to the runway but it was not disconcerting. After shut down, we had a 45 or so minute turn at the gate before our next leg which was to Philadelphia. I took this time to walk outside and take a few photos of the jet. The most obvious difference in the MAX is the larger engines and slightly different looking winglets than those installed on our -800s. Also different is the APU fairing which resembles that of the 767 or 787 more so than earlier model 737s. Other than that, there are not a lot of obvious tells to set a MAX apart from its NG sistren. Our flight to Philly was completely full at 175 passengers plus crew. Once loaded and ready to go, we pushed back and went through the lengthened start up process. It was on taxi out to the runway that the MAX let us down. Shortly after leaving the ramp and joining the parallel taxiway to Rwy 35L, the Master Caution and the L Elev Pitot heat light came on. This meant that a fault had occurred in the heating element for the elevator pitot tube which provides airspeed inputs to the elevator feel system. As Orlando is a maintenance base for us, I made the decision to return to the gate and have our mechanics look at the problem. As it turns out, this malfunction can be deferred through the use of the minimum equipment list (MEL). There are two of these systems installed and only one is required for flight with some restrictions. It was this restriction that sank us. The mechanics noted that this tail number had a history of this particular malfunction, but they had the deferral paperwork done very quickly and we were ready to go...or so I thought. The next thing we heard over the gate agent's radio was that the airplane was being taken out of service. I quickly called dispatch and our dispatcher didn't even know what was happening. 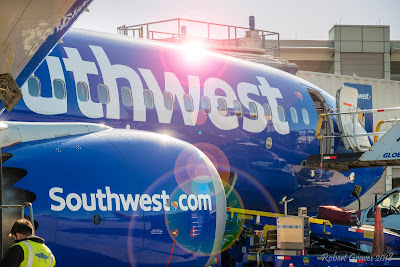 A phone call to the supervisor of dispatch revealed that while the flight to Philly was fine, it was the subsequent flight to Chicago that was the problem. The restriction for this maintenance deferral was that the aircraft couldn't be operated in forecast or actual icing conditions. And it turns out that the forecast for Chicago was a broken cloud layer with temperatures below freezing. The supervisor of dispatch didn't want the airplane stuck in Philly, so we lost our beautiful MAX. Luckily for us (and 175 passengers), another airplane was available. Tail swapping a full airplane took about an hour, but we were glad to be going again, only this time in an 800 series. The 737 MAX is loaded with new technology which makes it a pleasure to fly and saves a bunch of money in fuel costs which should make airline managements happy. But even with all the new technology, the airplane is still a 737 at heart and was quite easy to fly. The LEAP-1B engines are whisper quiet and the large displays present data in an elegant and easy to understand format. Of course, as we discovered, there will always be some bugs that need to be squashed in a new system, but I am quite confident that the MAX has a long and productive future in front of her. 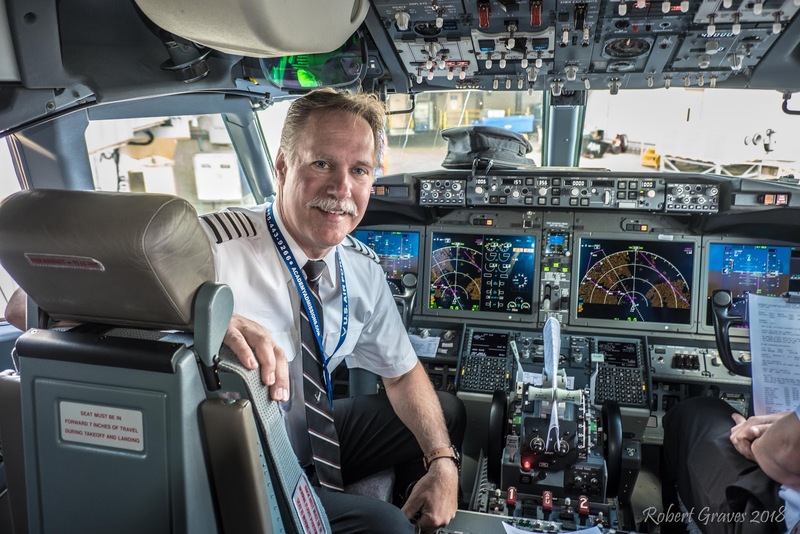 Captain Rob Graves is a veteran airline pilot and retired Air Force officer. He currently flies a Boeing 737 for a major American airline where he has over 25 years of experience. His Air Force career included instructing future USAF pilots in the T-37 primary jet trainer, aerial refueling in the KC-135 Stratotanker, and conducting worldwide logistics in the C-5 Galaxy cargo aircraft. He is the author of This is Your Captain Speaking, an aviation blog. It can be found at robertgraves.com. He also writes for Avgeekery.com. All photos by Robert Graves.